As it looks like I’m probably not going to be able to record a proper Spoiler Show episode about Man of Steel, the new Zack Snyder/Christopher Nolan Superman movie, I decided to get a few of my thoughts down here, before I forget. One the whole, I’d rate the film 3/4 stars. There were quite a few things I really enjoyed about the film, a few I found a little concerning, and a few I outright hated, but on the whole it’s decent. Much better than The Dark Knight Rises, but it’d be tough for that not to be true. Zod and the Phantom Zone Gang: Michael Shannon did an amazing job with the tough to realize character of General Zod, not leaning too much on the Terence Stamp version for nostalgia’s sake and crafting an entirely thrilling screen presence. They didn’t even rip off the best line from Superman II, which I thought would be a given, honestly. A nice surprise. This version of Zod rang closer to me to that presented in the year-long New Krypton saga from a few years ago, as he’s a kind of Kryptonian ultra-patriot, devoted to preserving what’s left of his race at all costs. The film kind of robs him motivation-wise, though, as we learn that’s he’s been genetically modified to do this task. So he’s closer to a robot just following its programming than someone actually choosing to do evil in the service of keeping the Kryptonian species alive, but it works. The fight scene once Zod and Superman really let loose is a thing of beauty, eclipsing the destruction of New York City in The Avengers by a country mile. I also found it interesting that Zod and friends decided to keep their societal taboo of not making children the old fashioned way during their 33-year sojourn in search of Superman. I mean, he seems pretty close to his second in command, why not attempt to stop the demise of the species? She was also a really compelling villain to watch onscreen. I especially liked how she played off against Christopher Meloni’s character. Visuals and Spectacle: We got into a little bit of a debate about the visual aesthetic of recent superhero films after watching this. The Nolan Batman films, (and to a lesser extent MoS) do not present a more “realistic” look at superhero action, as some would like to say. They may present a more plausible aesthetic, perhaps, cribbed from things like the Bourne films, noir and Nolan’s own Inception (especially the broken-down city imagery), but I’d hesitate to call this film more “realistic” than the 1970s ones. 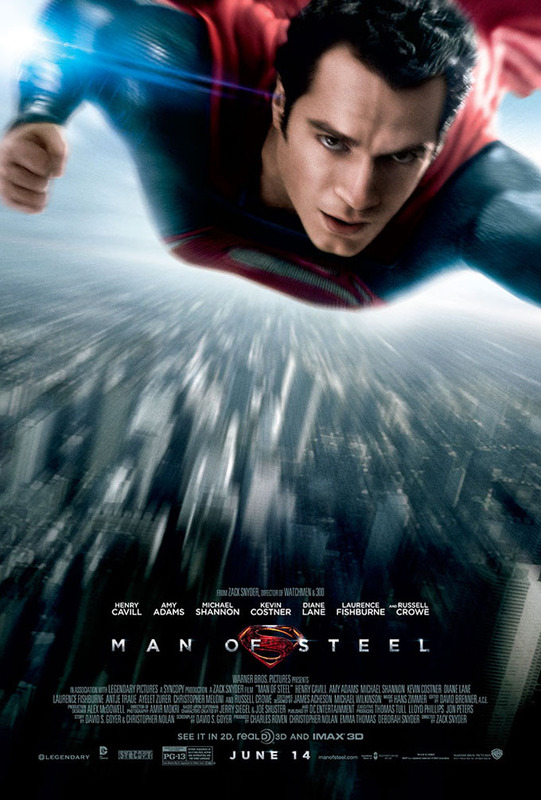 The original Superman film had to pull off its amazing imagery with practical effects: people on Krypton wore actual clothes, and the destruction was gotten across with camera techniques, practical effects and lighting rather than CGI to name one example. In fact, the only recent superhero movie I can think of that approaches “realism” aesthetically would be Chronicle, at least until it goes all Akira at the climax. So while I didn’t think MoS was realistic-looking in any sense, I thought a lot of it looked awesome. Krypton was realized in a ’70s album cover-meets-Halo style that we’d never seen before on film. As I mentioned above, the fights here on Earth looked great, and I’ll put in a special note for the H.R. Giger-meets Art Deco look of Kryptonian tech. I especially loved the animation when Jor-El explains the rise and fall of Krypton to Clark, it was an awesome way of getting that infodump across to the audience, shot in a hand-held style that kept you engaged rather than keeping you at arms length. My only concern is that the way Kryptonian robots, armour, etc. looked reminded me a lot of Brainiac, who I’ve always thought would have been a really good cinematic villain for Superman. I suppose they could either link him to the doomed planet by using that art direction again, or think of a cool new way to get him across. They haven’t said anything at all about using him, though, so this is all academic anyway. Supporting Cast: Quickly, I thought the actors playing Perry White, Pete Lombard, etc. at the Daily Planet were pretty good. There wasn’t much for them to do other than ruin Lois Lane’s day and then run away from falling buildings later, in a sequence that was uncomfortably 9-11y. (I wonder what people who were actually in New York that day will think of that?) As the two main female characters in the movie, Amy Adams and Diane Lane performed admirably. Hopefully Lois will have more to do in the next one, but I did enjoy how quickly she tracked Clark down. It reinforces the fact that he’s essentially a normal guy who just happens to be a superbeing, so he’s never learned any tradecraft in how to really disappear. Pa Kent: Having now read Mark Waid’s excellent rebuttal to the film, I’m still torn on the Pa Kent situation. For the duration of the film, he seems overly paranoid about people finding out about his son from the stars, when pretty much every other interpretation I can recall instead relies upon him just being an all right guy who leads by quiet, understated example. This is potentially indicative of the cynical and cold nature of the entire film. Trouble started early on, as Kent tells his son that maybe he shouldn’t have saved his class after their bus accident. I took this to mean that Kent didn’t actually know what to do in this situation, and in a moment of weakness he tells Clark exactly what he himself was grappling with in the situation. It was unclear, though. The part that really bothered me, even though Waid was all for it, is the manner of his death. Paranoid and secretive to the last, Pa Kent chooses to die by way of an oncoming hurricane instead of letting his son save him, which he could have done easily. This is problematic for two reasons, the second of which I’ll get to when talking about the film’s uneven handling of Superman, but the first is this: Jonathan Kent should die of something Clark can’t fix. Up until the oft-discussed New 52 reboot of DC’s comic continuity, the death of Superman’s human father was one of the most poignant and heartfelt story decisions in recent memory. While Superman is dealing with some problems caused by Brainiac (see, you knew he’d show up again), Pa Kent dies of a heart attack at his Smallville home. It serves as an example to the attentive reader that as much as Superman is a godlike being from another world, he still faces many of the challenges us regular mortals do. When the film chose to do away with Pa Kent in the way it did, it made Superman less human, less fallible, and less relatable. Superman: Here’s the big one. The Superman presented to us in this movie is not the sort of Superman I normally enjoy. He is an “ends justify the means” kind of character in many scenes, rather than one who tries to help as many people as he can. While I noted above that I enjoyed the city-smashing and destruction in the film’s last fight scene, I had to kind of take myself out of the characteristic Superman mode to do so. The character presented to us here is closer in temperament and heroic technique to someone like Apollo from The Authority, or one of the many Superman analogues that show up in the works of Mark Millar, like Superior or indeed the “Red Son” Superman from the book of the same name. When we are told numerous times throughout the narrative that Superman will be the one humans will be inspired by, that he’ll bring us into the light, there is very little evidence to support this claim. The best we get is a female military officer thinking he’s super hot. There are other notes that ring false as well; Superman destroying the douchebag bar patron’s truck, or agreeing to be handcuffed only to break them and scare everyone. This to me is the main flaw of the film, and I feel it mostly has to do with the tone-deaf script handed in by David Goyer. They should maybe get someone else next time. So in conclusion, I enjoyed Man of Steel, but it is no Superman. There’s no sense of fun in this film, which is fine, but not what I was hoping for. Sadly, he’s not the Superman I wanted, but I would not go so far as to say he’s the Superman I deserved. Still, I look forward to seeing what comes next, as on a purely visual, visceral level, the film delivers, at least to a certain extent. • Did you catch the logo on the satellite near the end? It could be a link to another re-imagined Kirby creation, Brother Eye. Having to defeat a bunch of OMACs might be a cool idea for a future film. • Smallville, Kansas has a lot of damn corporate entities littering its Main Street. It’s actually kind of embarrassing to watch, especially the IHOP bit. So while Superman did a piss-poor job of protecting the citizens of the city, the real victims must be all the franchisees who’ll have to rebuild. Not the hero we deserved nor needed – not unless you were receiving income from it. 🙂 It did feel like the trite opportunity greeds in that movie business enjoy snatching up. The Nolan Batman films were over – someone probably felt this was the ripe moment to indulge us with another DC Universe spectacle.